The basic mechanism used by BellHawk to track materials is the use of location barcodes. Location barcodes are placed on shelves and bins. They are also hung over floor locations. When an item with a license plate tracking barcode is placed in a location then the location barcode is scanned followed by the license plate tracking barcodes of all the items placed in that location. These locations are then recorded in the containers table entries for each of the containers or items that have been put away. While it is convenient to place a license plate tracking barcode on a pallet or box or roll of materials, it is not convenient to do this for nuts, bolts and washers, for example. BellHawk tracks loose or bulk materials by simply scanning the location barcode and then recording the part number and the quantity of materials added to or withdrawn from that location. If there are multiple part numbers in a single location then BellHawk will request the location then the part number when materials are being withdrawn. One of the great benefits of using location barcodes is that it makes "taking inventory" or "cycle counting" a very quick operation. 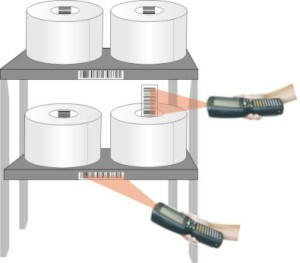 Taking inventory consists of scanning a location barcode, using a mobile computer. The mobile computer then displays what materials should be in that location. 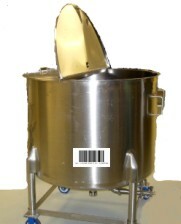 If the location is a bin of loose material, then a qualified user can adjust the quantity of part in the bin. If a container or a serialized item is missing from the location, it can be marked as missing. Similarly, a container or serialized item can be marked as found and electronically crossed off the list of missing items and moved to its new location in the database. Tracking barcodes on bins, boxes, pallets and reels or similar containers can also be scanned on the quantity of material in/on the container adjusted. This process can reduce the time to take inventory from days to hours. It can also be performed incrementally, which production and warehouse operations are in progress, to enable data entry problems to be quickly spotted and corrected. BellHawk tracks lot numbers of loose materials, containered materials, as well as lot numbers of serialized and individually tracked items. These lot numbers can be vendor lot numbers, internal lot numbers or they can be generated automatically by BellHawk. An important feature of BellHawk is its ability to track nested containers through the containers table. Loose material can be recorded as being in a container. 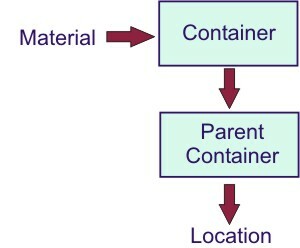 This container can be recorded as being inside another parent container, that can itself have a parent container, which is stored in a location. The benefit of this approach is that when we move a parent container, all its contents are automatically moved by BellHawk. Thus we might have boxes a number of individually barcoded serialized items that are stacked on a pallet. When we move the pallet to a new location we simply scan the tracking barcode on the pallet and the location barcode at the destination to record the movement of all the material. We do not have to unpack and scan each of the serialized items to record their movement. BellHawk can track the movement of loose material and serialized items to or from a location or container. It can also track the movement of containers to and from locations or other containers. The BellHawk MES also includes the ability to scan materials into job steps by scanning the location or container barcodes, selecting the part number and entering the quantity of materials consumed. Unused materials can also be recorded as returned to an inventory location or container. BellHawk tracks barcoded WIP between job steps. Here the material out from a job step is placed in a barcoded container. This material is scanned as WIP out from a job step and can then be treated just like any other barcoded inventory. It can then be scanned into the next job step, when the time comes to process this material. Please click on the following link to view methods that BellHawk uses to track the transformation of materials.